The MRH Master Planners have announced two dates for public meetings: 22nd January (Options) and 25th February (Final Proposals). It is very important that the Master Planners hear your views on how you would like to see the Murray Hospital site developed and also hear your concerns about any change of use on the site. Around 120 members of the public attended a consultation on Tuesday 10 December 2013 to voice their strong concerns about the fate of the Murray Royal Hospital site. Read more about the meeting here. The meeting was hosted by Ryden and Austin-Smith:Lord, who have been appointed as Master Planners for the disposal of land and buildings discarded by NHS Tayside. The more people write in and participate in the consultation, the more likely they are to listen to the voice of the local community. The next stage of the process is that Ryden’s are going to publish the options at a public meeting on the 22nd January, and then present the final development scheme on the 25th February. They hope to lodge the full planning application in April 2014. Following concerns about noise, a code of conduct has been agreed between Perth and Kinross Council and jet skiers using the Tay in Perth. The code was negociated by Councillor Heather Stewart, and we suggest that any breaches should be raised with her. Code of Conduct (PDF file). NHS Tayside is selling the 20 acres of parkland and many buildings at the Murray Royal Hospital site which are now surplus to their requirements. They have successfully applied in the Local Development Plan for 250 dwellings on the site and are now intending to submit a planning application early in 2014. This is an important public consultation on the options for the disposal of these assets. What happens to this large site will have a major impact on our community and this is your chance to make your thoughts and opinions known to the decision-makers. Tell your neighbours. Come along! Do not miss it!7.00 p.m. on 10 December in the Murray Royal Hospital Hub building. We are changing the months of our meetings in 2014 to February, May, August and November. As before we will be meeting on the third Thursday of the month. The change from six meetings a year to four will allow us to spend more time on other ways of talking with the community. You needn’t wait for the next meeting to raise an issue – send us an email. We always respond and can arrange a personal meeting if needed. The next meeting of Bridgend Gannochy & Kinnoull Community Council is on Thursday 21st November at 7.30p.m. in Gannochy Community Hall (in Gannochy Avenue). Stuart Hope, the Safer Communities Supervision from P&KC will be there to speak about Community Wardens. All residents of the area are welcome to attend all or part of the meeting. Come along and help Beautiful Perth plant new shrubs and bulbs at Back Wynd Car Park and for a general tidy up! Meet at the car park at Bridgend at 10am – gardening tools, litter pickers, etc. will be provided. For more information, contact Jenny Williams on 01738 476447, or email info@beautifulperth.org. The minutes of the last meeting are are in this PDF file. Following our previous meeting on 20 June 2013, the Community Council takes a break from public meetings until September 2013. We wish you a very pleasant summer but please feel free to contact us on bgkcc@hotmail.co.uk should you feel the need. Beautiful Perth are holding an action evening at Bridgend car park on Monday 24th June at 6pm. Come along and join them on a weeding, planting and tidy-up session for an hour or so. Equipment will be provided, but please bring your own gloves. Perth and Kinross Council are holding an Action Evening on Thursday 20th June at Bellwood Riverside Park, from 5:30pm to 8:30pm. The next meeting of Bridgend Gannochy & Kinnoull Community Council is on Thursday 20th June at 7.30p.m. in Gannochy Community Hall (in Gannochy Avenue). All residents of the area are welcome to attend all or part of the meeting. We have asked for updates from our PKC Councillors at our next meeting on 16th May at 7.30 p.m. in the Gannochy Community Hall, Gannochy Avenue (off Haddon Road). Additional reflective bollards at Lochie Brae / Gannochy Road junction (Cllr. Barrett). The usual meeting will be preceded by our Annual General Meeting which only takes a few minutes. Residents of our area are welcome to attend all or part of any meeting. “Beautiful Perth” has started work to improve the car park at Back Wynd in Bridgend. Your help is needed on Saturday 6th April at 10a.m. to plant shrubs and have a general tidy up. Joining in such an activity is great fun and provides a real sense of satisfaction. Equipment will be provided but you should wear strong footwear and bring gardening gloves. “Beautiful Perth” will carry out improvements to the Bridgend Car Park at the foot of Lochie Brae. . They will put in shrubs and instal a bench in memory of Peter Rogers who was killed in a New Zealand mining accident recently. He used to live nearby. The bench will be placed to look towards the bridge and his old home. We have been told that Gannochy Road is to be repaired. Perth & Kinross Council will make temporary repairs to the road surface pending their issuing a notice to the Murray Royal Hospital contractor (Morgan Sindall) that it is Morgan Sindall’s responsibility to have the road stripped and resurfaced. If they do not carry out the work PKC will do it at Morgan Sindall’s expense. The notice should have been served before work began but we are assured that it can be served retrospectively. Morgan Sindall were of the view that as PKC had insisted on their using Gannochy Road it was up to PKC to ensure that the road was fit for purpose. It may take some time for agreement to be reached. We have asked for the consideration of road repairs to include all the roads around the MRH site. 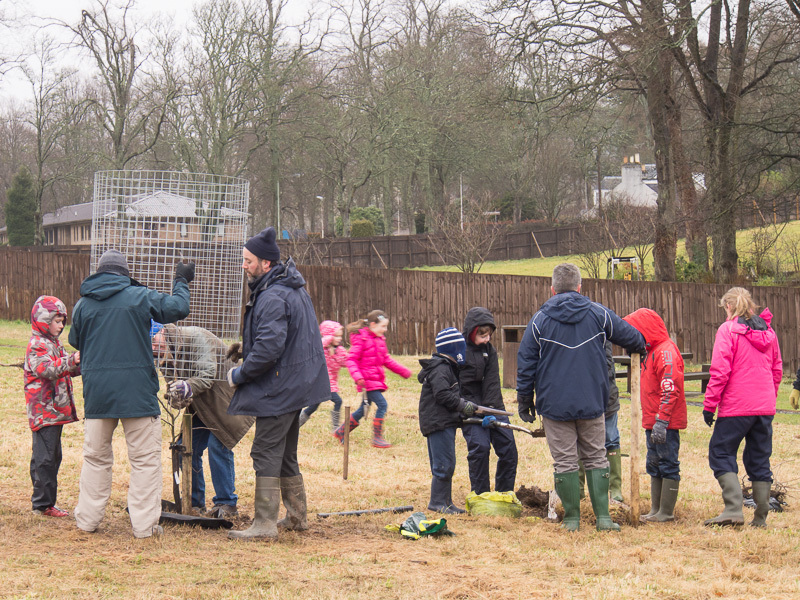 The children of Kinnoull Primary School planted their fruit trees in the Millennium Park on Saturday 9th March. They were helped by their parents and Friends of the Millennium Park under the guidance of Terry Myers. Each tree was staked and rabbit proofed and had a mesh fence erected around it to keep off deer. Although it was a bitterly cold day there was a happy atmosphere and satisfaction at a job well done. Murray Royal Mud Misery To End Soon? We have been told that the muck shifting on the roads around Murray Royal Hospital will end soon. The subcontractors (Careys) have said that all of the subsoil from the mound at the top of the site has been moved. Drains are to be inserted under the new football pitch near the Gannochy Road entrance. When that work is complete the topsoil from the mound will be moved to be spread on to the football pitch. Careys reckon that it will take only a week for lorries and moxy earth movers to complete that task. No more muddy roads, no more dirty cars, no more filthy paths and driveways and no more splashed clothes! 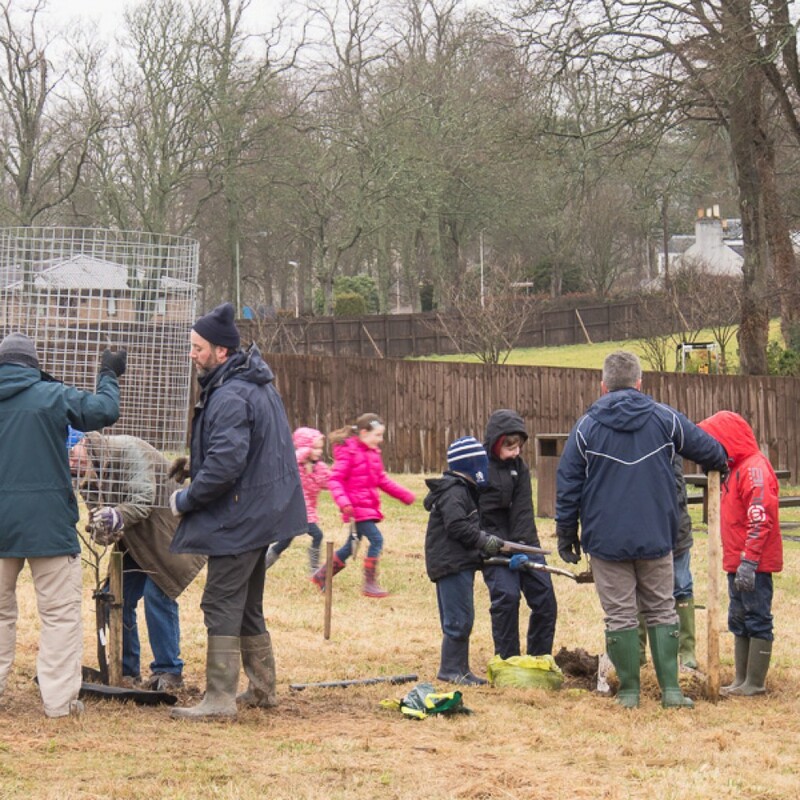 Children and Staff of Kinnoull Primary School will be planting eight fruit trees in the Millennium Park at 10a.m.on Saturday 9th March with help from the Friends of the Millennium Park. You are welcome to come along to help if you can (with protective gloves, a spade and/or garden fork) or just to be part of the occasion. The school orchard will be planted next to the children’s play area on the high ground at the top of the Park. The forecast for tomorrow is dry with some sun, but cold. The holes for the trees are dug and need a little additional work so that each will properly accommodate its tree. When a tree is planted a ready-made mesh screen will be put in place to protect it from grazing animals, mainly rabbit and deer. There will be written guidelines for both the planting and the fixing of screens, and there will be experts to offer assistance and advice. Please come to join the Friends and the children in marking this special event in the history of the Millennium Park. The next meeting of the Perth Left Bank Development Trust will be held at 7.30p.m. on Monday 25th February in Gannochy Community Hall in Gannochy Avenue off Haddon Road. An update on the status of the Community Plan will be presented. There are some interesting happenings in Bridgend as well as good progress in the publication of information about new walks in our area. Trust members as well as members of the public are encouraged to come along. Teas and coffees will be provided. The next meeting of FOMPs (Friends of the Millennium Park) will be held on Friday 22nd February at 6p.m.-7p.m. in the studio of Annat Coach House (next to the Park). The Community Council is still receiving lots of complaints about the mud on the roads and pavements around Murray Royal Hospital. Residents are reporting dirty cars, mud deposited on paths and driveways, splashes on clothes, road markings being obscured and drains being blocked. One resident asked if the contractors would reimburse him for having to clean his car twice a week! We are raising this matter regularly with the contractors and subcontractors and with Perth and Kinross Council. If you are concerned you can contact the Council directly. The building control officer in charge is Eddie Jordan eddie.jordan@pkc.gov.uk . Councillor Peter Barrett peter.barrett@pkc.org.uk is also taking an interest in this. You can get in touch with Perth and Kinross Council on 01738 475000 or 0800 23 23 23. You can contact the subcontractors, Careys, via Harry Murray (harry.murray@careysplc.co.uk) tel.07836 279611. The contacts for the main contractors, Morgan Sindall, are Kevin Rooney (kevin.rooney@morgansindall.com and Martin Boyle (martin.boyle@morgansindall.com) tel. 0141 843 6300. Perth & Kinross Council has published Committee Reports on proposed waiting and speed restrictions for the Gannochy area. To try to prevent rat runs there would be a 20mph speed limit throughout Gannochy. There would also be yellow lines on Muirhall Road and parts of other streets because of concerns about parking once the new Murray Royal Hospital is fully operational. At the moment staff and visitors can park in the surplus hospital grounds but these will eventually be used for other purposes. You can access the Reports at www.pkc.gov.uk/planning Search for “Gannochy” and then click on 13.01.30 Item 12. Any comments should be sent to DDuncan@pkc.gov.uk by 20th February. McCarthy & Stone and Balhousie Care Group are to seek an amendment to Planning Consent Ref 11/01333/FLM which relates to the site of the former Tayside Nursing Home in Isla Road. This would allow the erection of a new healthcare facility whereby 52 sheltered units would replace a 60 bedcare home. They intend to meet interested parties (including the Community Council) in March and will hold an exhibition for the public in St Matthew’s Church Hall in April. We have a new Community Police Officer, Constable Pamela Blower, who replaces Constable MacLaren. We are very happy to welcome Constable Blower and hope that she will be allowed to remain with us for some time. We have had a series of officers in quick succession and feel that we do not have a chance to get to know them and, more importantly, they do not get the chance to get to know us or our area. An Exhibition entitled “New Perspectives. Observations on Community Architecture in Perth” in the A.K Bell Library will include Bridgend. Seven Students of Architecture studying for Master degrees will showcase a variety of studies within Perth focusing on local engagement to create strategies for the city. It will run from Saturday 2nd to Saturday 9th March. There will be an opportunity for discussion with the students on the opening day from 10a.m. to 4p.m..
£10.3 million of Climate Challenge Fund (CCF) grants, available from the Scottish Government until March 2015, could provide grants of £150,000 per year and support for the Community Council to reduce our community’s carbon footprint and improve local facilities. CCF grants have helped community councils work with their community to provide household energy efficiency surveys and advice to cut fuel bills; provide facilities so the community can grow its own fruit and veg; open up local rights of way and promote low carbon transport options. CCF grants can also help other community groups to work with their community to provide energy efficient refurbishments of community buildings and energy efficiency advice. Through new £750 Development Grants CCF also covers support for disadvantaged communities and young people in developing their CCF application. The next meeting of Bridgend Gannochy & Kinnoull Community Council is on Thursday 17th January at 7.30p.m. in Gannochy Community Hall (off Haddon Road). All residents of the area are welcome to attend all or part of the meeting. The Inquiry into the Refusal of Grundon’s Appeal relating to its Planning Application for a Waste to Energy Facility at Shore Road has concluded but the parties involved in the Inquiry can still make submissions. Our Chairman, Graham Fleming has sent in a Submission on Odour on our behalf. We are indebted to him and to our Vice Chairman, Dave Beattie for their dedication and hard work. There is a shocking amount of mud on the roads around Murray Royal Hospital. Morgan Sindall’s subcontractors, P J Carey plc have started to move earth from the top to the bottom of the hospital site down Muirhall Road and along Gannochy Road. Drivers should beware as the mud is obscuring the road markings and making the road slippy. Pedestrians should beware as the pavements are also slicked with mud and people have been splashed. Road sweepers are being sent out regularly. They make an enormous amount of noise but only wet the roads.They are not lifting the mud. The mud goes well down Lochie Brae and two of the drains are full. Given last year’s flooding at Bridgend this is of great concern. Mud is being splashed on to garden walls and carried on to paths and driveways. If you are affected the contact at the subcontractors is Harry Murray (harry.murray@careysplc.co.uk) tel.07836 279611. Morgan Sindall’s contacts are Kevin Rooney (kevin.rooney@morgansindall.com and Martin Boyle (martin.boyle@morgansindall.com) tel. 0141 843 6300. You can also contact Perth and Kinross Council on 0800 23 23 23. Our local P&KC councillors are invited to attend our meetings so if you wish to raise an issue with them you can do so there. 1. Councillor Coburn is seeking to have the post at Bellwood Park replaced. .
2. Cllr. Stewart is convening another meeting with the jet skiers to try to reach a compromise. b) to provide a report on the capacity of the drainage system to cope with adverse conditions. 4. Cllrs Stewart and MacLellan are addressing overhanging trees and hedging, some of which are obscuring street lighting in Manse Road. 5. Cllrs Stewart and MacLellan are provide to statistics for the number of planning department recommendations which have been overturned at Development Management/Control Committee Meetings. Our next meeting is on Thursday 17th January at 7.30p.m. in Gannochy Community Hall (off Haddon Road). We hope that our Councillors will be able to attend and provide updates and listen to any other concerns. As 2013 begins we wonder what the New Year will bring to Bridgend, Gannochy and Kinnoull. The Community Council has been asked by members of our community to address all of these issues. We are trying to do so and have asked our local Perth & Kinross Councillors and officials for help to achieve our aims. Although we do a lot the work is shared and if you would like to join us please email bgkcc@hotmail.co.uk . You would be very welcome and would probably find it more interesting and enjoyable than you might think.